This class will use the book The Handbook for We the People as its guide. Each participant/couple/family will receive a copy of this book. The cost is $25, which includes lunch and the book shown. Couples and families that can share a copy of the book can pay $15 for each additional member. Please contact Mary Sue Ribardo at 979-778-7295 or Mark Coppock at markcoppock@gmail.com to sign up so we can make plans for the correct number of meals. Your future depends on it. The future of our nation depends on it. Your freedom to exercise your natural rights depends on it. Does any branch of the federal government have the constitutional authority to determine whether or not it is permissible to eat hot dogs and chips in your school cafeteria, to defend yourself with a weapon of your choice, or to pray at your school event? Or to create regulations over every aspect of business, and of life? NO—yet we the people have been condoning this, with tacit approval, for far too long. The Constitution is the rule book that we created for the federal government. It is our permission slip for our central government to exist and function. It is not a rule book for the states or the people. Yet this is not how we have been treating the Constitution, for many generations now. But this is changing, and boot camps like this are happening around the country. 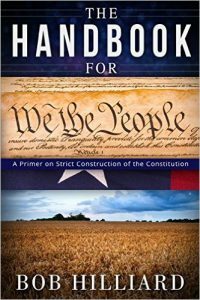 Strict construction means interpreting the Constitution based on what it actually says, with the clarifications given us by our nation’s founders. * The framers of our Constitution expected “We the People” to be the natural guardians of our own freedoms, not the elected officials or appointed judges. How is it possible for we the people to do that if we do not have a basic working knowledge of the rules? Please join us on January 14! * in very clear explanations in the Federalist Papers, which will be covered in the class.